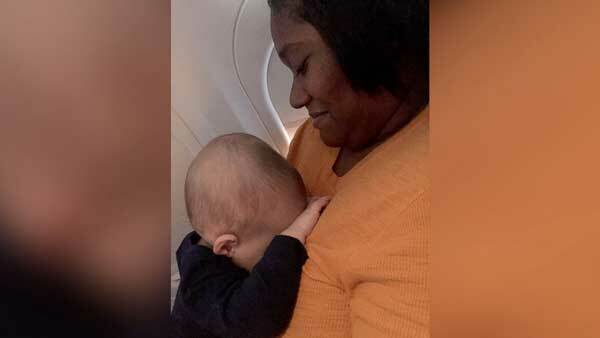 CHICAGO -- A dad's first flight alone with his baby was not as painful as he anticipated, thanks to the kindness of the woman sitting next to him, ABC News reports. Evan Hughes, 32, was flying to Dallas with his 8-month-old son, Ki, after visiting friends in Chicago. He was forced to take a separate flight from his wife, Kari, because of a storm that derailed their travel plans. When Hughes took his seat next to India Massinburg, a 25-year-old child care worker, Ki started getting antsy. "He started fighting me, trying to climb over me to get to her because she was near the window," Hughes said. "She offered to hold him so he could look out the window but I said no because I didn't want to impose." Hughes eventually let Ki sit on Massinburg's lap and look out the window. As Ki got sleepy, Massingburg even let Ki stay on her lap and sleep. Ki slept almost 30 minutes, allowing Hughes to take a nap too. For the full story from ABC News, click here.